Who says you can't have dessert for dinner? That is crazy talk if you ask me! Tonight I was in the mood for a fall time dessert and it happened to be dinner time. So I thought I would use a modified version of a grain free "tortilla chip" that I made last night to eat with my guacamole and create a pie crust. 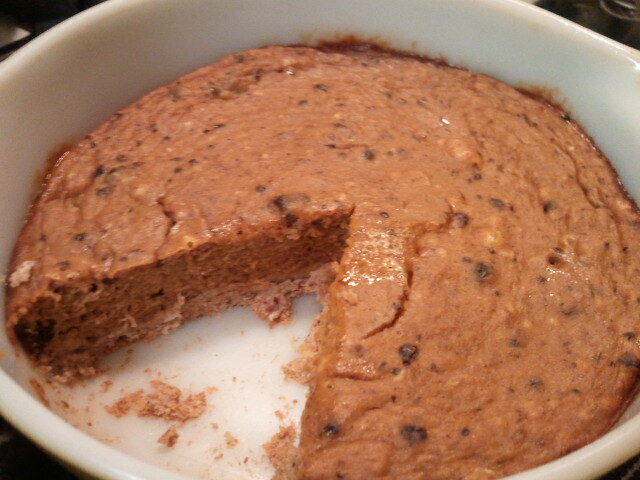 The crust turned out really well, but I think it could be better if I had a non-stick pan vs. the glass pan that I used. The filling was very easy and packed with protein, just how I like it! This delicious concoction definitely cured my craving! Bon Appétit! Preheat oven to 375°F. 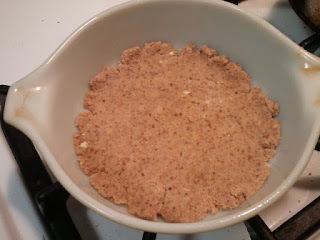 Mix the dry crust ingredients together a bowl, then add egg whites and stir until a dough forms. 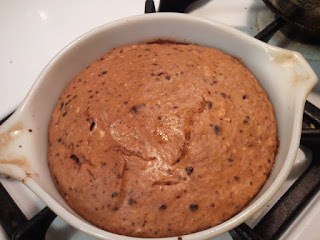 Take one single serve baking dish, I used a glass Pyrex baking dish, but I think it would work best if you used a non-stick pan or baked it onto parchment paper so the crust doesn't stick to the bottom. Coat the bottom and sides of the pan with the oil of your choice. Place the ball of dough into the pan, flatten it out with your fingers until a crust is formed on the bottom of the dish. Place pan in the oven for 4-5 minutes, so the crust starts to harden. While the crust is baking, mix the dry pie filling ingredients together in a bowl, then add the wet ingredients and mix all together. 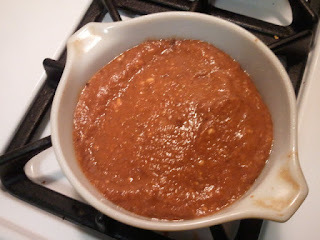 Pour the mixture over the pie crust and bake for 15-20 minutes. The time will vary depending on your oven, so keep a watchful eye on it. Once it has cooked, let the pie cool and Enjoy!